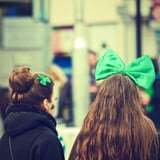 St. Patrick’s Day is one of those holidays that seems to resonate with everyone, whether you’re Irish or not. The green decorations, festive food, and endless outfit options are pretty inescapable in March, so why not get your children involved in the spirit of the season as well? While they can’t indulge in certain St. Patrick’s Day traditions (green beer, anyone? ), you might be surprised by how many family-friendly jokes leprechauns and four-leaf clovers can inspire. Whether you’re throwing your kids a little pot-of-gold-themed party with their friends or simply want to put some fun into their breakfast routine, have the following jokes on hand. But be warned – you may be hearing these one-liners on repeat for weeks to come! ← The Best Underwear for the Outdoors? A Speedo.